Saturday, September 17th was the 3rd Annual Fall Parts Exchange and Parking Lot Sale at California Car Cover. We had a dozen local customers and friends show up to swap parts and collectibles. It was a great event and mark your calendar for our spring event sometime in May. Our website will post the scheduled date online. During the event, one of our Golden Shine team members was on hand demonstrating our Golden Shine Car Care Products. 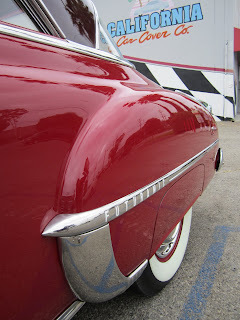 There were plenty of wheels, tires, bumpers, mirrors and much more on hand at the show. It was a great place to find a deal on some diecast cars. I even picked up a few t-shirts from a vendor. Even though it was a parking lot sale and parts exchange there were a handful of classic cars in our parking lot all morning. Here are just a few of them I could snap photos of while working. 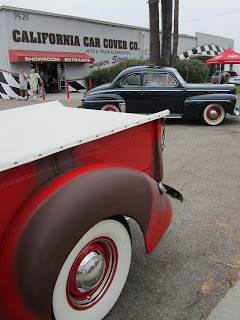 The California Car Cover canopies were packed with seasonal merchandise and discontinued products. It was a great time to find a deal on just about anything in our warehouse. We had 12 pallets of merchandise out for sale. We only host this event twice a year, so we really bring out the merchandise and the savings. As soon as the sun came out, USA Tacos served up tasty tacos and tortas for customers. While the parking lot sale was winding down, the Golden Shine VW Car Show was just starting. A group of local Volkswagen and Audi enthusiasts came to hang out at California Car Cover on Saturday afternoon. It was an opportunity for us to meet some new customers and interact with the VW crowd. Golden Shine is a car care sponsor of the upcoming Oktoberfest car show in Big Bear, so it was a chance for locals to sign up for the show and check out the products. Guests had the chance to sign up for the Oktoberfest event which will be in Big Bear on October 6th-8th. More details on the event can be found on Facebook. Brandon, from the Golden Shine team, did product demonstrations for the attendees. The group practiced the Air Ride competitions in preparation for Oktoberfest. Thanks to everyone from Oktoberfest for coming out to support the event. We will see all of you at the fun in Big Bear in a few weeks. If you cannot make it up there I will post coverage of the event on here after the show.